Beatz is a free, open source turnkey script for building sites similar in features to PureVolume, GarageBand, MySpace Music, Last.FM where music artists meet their listeners and get famous. Beatz acts as a bridge between the artist and fans. Beatz can power online social networking sites that cater to musicians, dancers, singers, songwriters, composers, comedians, hip hop rappers r&b singers, country music singers, hip hop dancers, models, actors, & actresses. Beatz (by Cogzidel) is based on Joomla 1.5 so many components and modules available for Joomla can be used, including the VideoWhisper Live Streaming component. In addition to that, some special tweaks including a module are available. This will add a Live Broadcast entry to the artist menu and the Live Video Watch interface on the artist page. 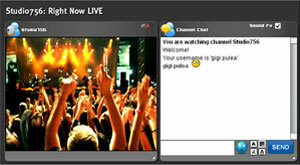 Users can chat realtime on artist page and also watch together live broadcasts. The special module will list artists broadcasting live with snapshots on the frontpage (and/or other pages where module is displayed). See a live demo of the Beatz with Live Streaming on AudioTribes . Register and artist account and a listener account to do some testing. 2. Install Beatz and tweaks. After downloading tweaked version just copy it to your website and follow instructions. 2. Upload and install Joomla component and Beatz module from administrator area. 4. Enable Beatz Live Stream Module to show on home page in midBlock. 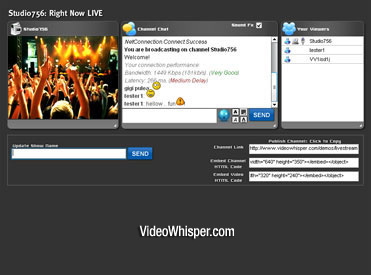 VideoWhisper staff can setup Beatz with Live Streaming. A full mode license for streaming software must be ordered separetely if needed, independent of Beatz installation. The Beatz software was developed by Cogzidel based on Joomla 1.5 and GPL2 applies. This joomla integration component is also provided with full php source code under GPL. This basicly means you can use, tweak, distribute the component php files as you wish. Contact us if you have interesting tweaks for this or derived components and want to share these with the world. See Joomla Live Streaming component page for Live Streaming. Get free Beatz templates from Cogzidel Templates. Beatz developers (Cogzidel Technologies) can also provide paid support, customizations, templates for the free Beatz software. Contact them for more details about the scripts. This includes multiple live audio/video broadcasting options, changing show title (status), embed code (if enabled), user list to see and kick listeners. This can contain video, text chat, user list and is also available when artist is offline: users can text chat. Watch interface shows on artist profile page. Artists broadcasting live are shown on the fronpage with a special module.